I'm excited to be telling you about another fabulous book by Susan K. Marlow. 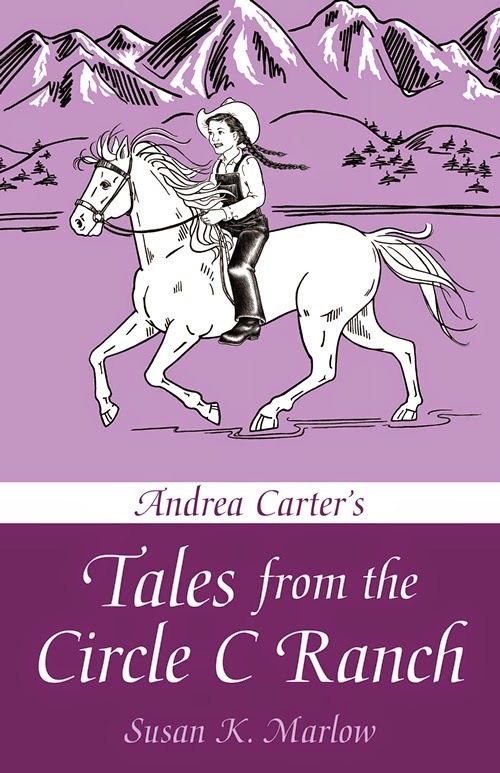 Andrea Carter's Tales from the Circle C Ranch is a collection of stories that cover about seven years of Andi's life. And they are lots of fun. The independent tomboy Andrea Carter and her beloved horse, Taffy, were first introduced in Andrea Carter and the Long Ride Home in 2005. Since then, popular author Susan Marlow has penned five more books in the Circle C Adventures series, filled in Andi's early years with the Circle C Beginnings series, and started a chronicle of Andrea's teen years in Circle C Milestones. Published to celebrate the tenth anniversary of this positive role model for girls, Andrea Carter's Tales from the Circle C Ranch is a collection of short stories inspired by fan questions that fills in many of the gaps between Circle C Beginnings and Circle C Adventures. Taking place between 1873 and 1880, each story is prefaced by an explanatory note that pinpoints the action of the story in relation to events in the existing Andrea Carter books. Wholesome fun, and with a clear Christian message throughout, Andrea Carter's Tales from the Circle C Ranch is a must-read for fans of the series and a fun introduction for those who haven't yet discovered these historical gems. These stories are delightful, even if you haven't read many of the books about Andrea Carter. I've only read a couple before, but these were fun anyway. I would imagine for anyone who has read most of Marlow's books about Andi, this would be even more special. Andi is delightful. Mischievous, spunky, and definitely a handful. I read this book myself, but I will be sharing this with my kids. My daughter will love it for sure, as she has read a few of the younger Andi books and she adores Andi. My sons will appreciate the way Andi's brothers are written. They are all such wonderful examples of how a big brother should behave, as they are not always perfect or sweet, but when the chips are down they are there to protect their sister. Of course, the downside of reading this book is that I now want to complete my Circle C collection.